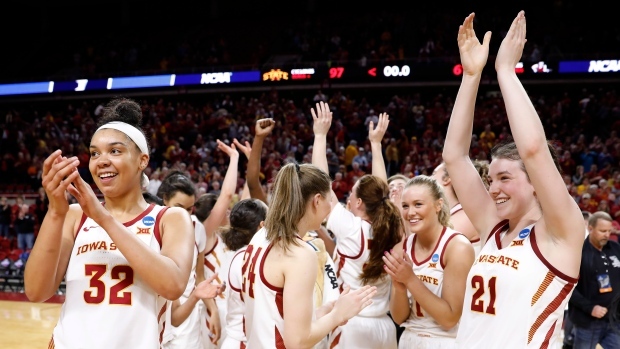 AMES, Iowa -- Canada's Bridget Carleton led four players in double figures with 23 points and third-seeded Iowa State routed New Mexico State 97-61 on Saturday for its first NCAA Tournament win since 2013. Alexa Middleton had 15 points, nine assists and five rebounds for the Cyclones (26-8), who were one-and-done in their last three trips to the Big Dance. On Monday they'll face 11th-seeded Missouri State -- which stunned DePaul 89-78 earlier Saturday -- in search of the program's first Sweet 16 appearance in nine years. Iowa State never trailed -- and it never let the Aggies' explosive offence breathe either. Carleton, the Big 12 player of the year from Chatham, Ont., hit a long 3 late in the third quarter gave the Cyclones their first 30-point lead at 73-42. Iowa State pulled its starters early in the fourth quarter. Iowa State: After seeing the rival Hawkeyes struggle mightily with a No. 15 seed on Friday, the Cyclones eased any fears over a possible upset with a stirring start. Iowa State will likely find buckets much tougher to come by on Monday when they host the Bears -- who picked up their first NCAA win since superstar Jackie Stiles led them to the Final Four in 2001. New Mexico State: Salas, the back-to-back player of the year in the WAC, went to the bench with two fouls late in the first quarter. The Cyclones exploited her absence, reeling off 10 straight points to jump ahead 36-18. Still, the Aggies' 17-game winning streak tied a school record.